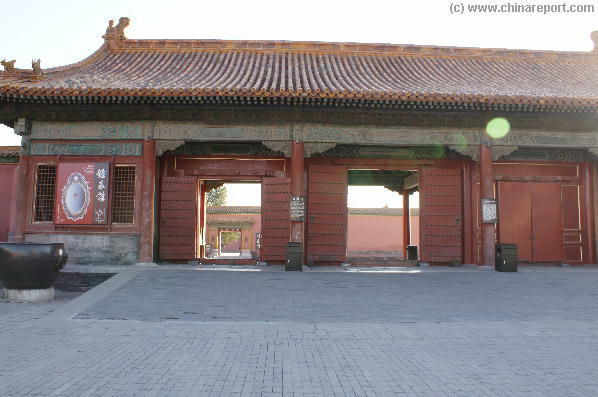 Behind the Hall of Preserving Harmony (Bao He Dian) lies the largest Dragon-Carved stone slab in the Palace. 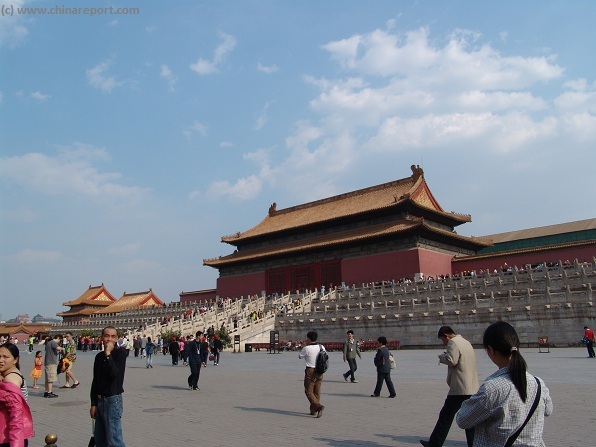 The slab is made from a single cut piece of stone, 16 meters and 57 centimeters in length, 3 meters and 7 centimeters wide and 1.7 meters in thickness. 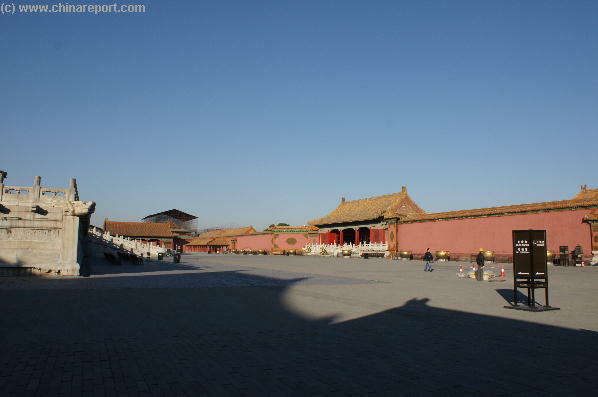 This gargantuan load, over 200 tons of stone in all, was installed at very first construction of the Imperial Palace at the beginning of the 15Th Century and has remained in place eversince. 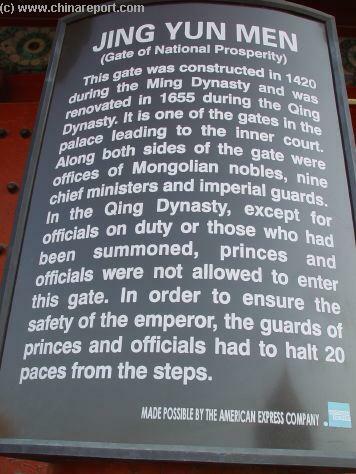 It was only once recarved, in place, in the year 1761 AD, during the succesful and prosperous Reign of the Qianlong Emperor of the Ching Dynasty. 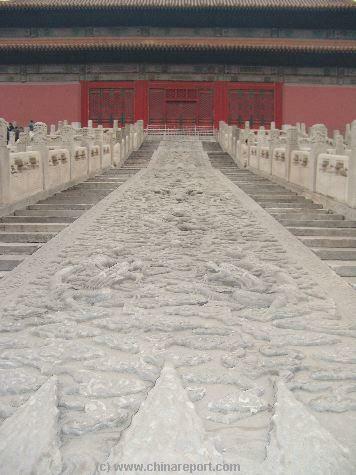 Destined to be the sacred path of the Emperor over which he would reatreat from his Throne Rooms to his private quaters at the Inner Court, the transportation of this huge stone piece is a story within itself. 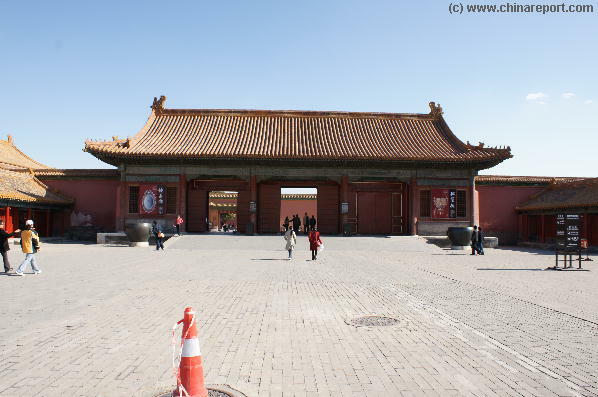 Over 10.000 men labored for months to see stone on it's way from Fangshan, south-west of Beijing where it was cut, to this spot inside the Imperial Palace of Beijing. 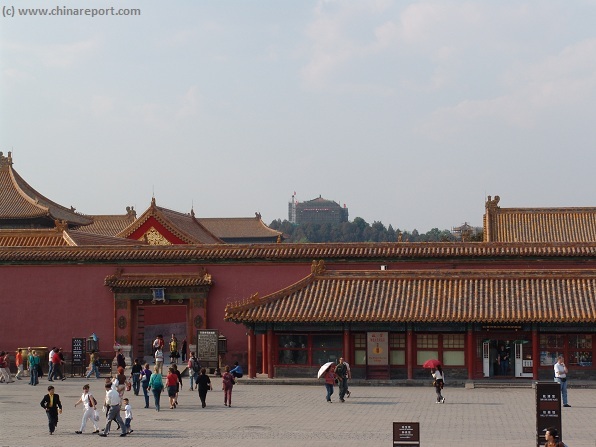 You are nearing the temporary end of the Virtual Forbidden City ! 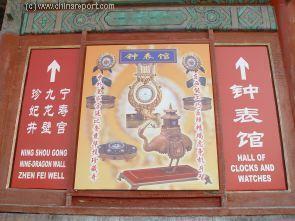 More additions soon, including all 6 western palaces + all 6 eastern palaces and their Imperial Art Collections. 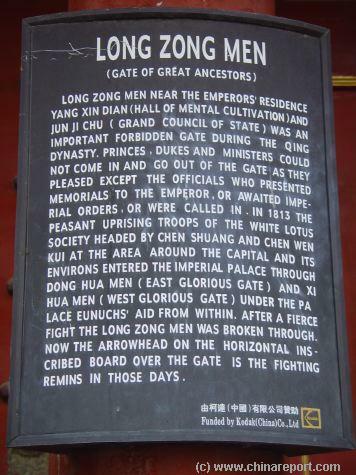 Overview of the Gate of Heavenly Purity, the central Main Gate at the Inner Court access Square. 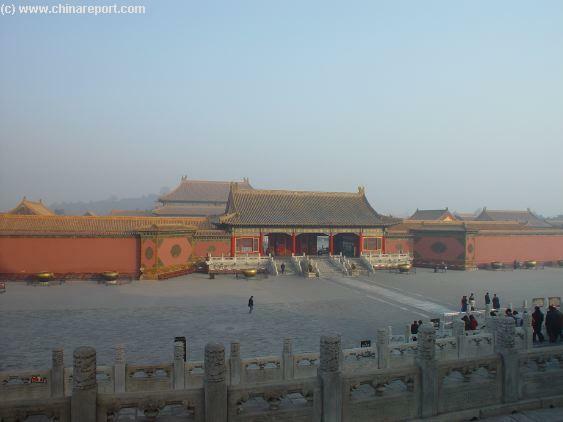 Behind the Gate of Heavenly Purity the Rooftiles of the Palace of Heavenly Purity, the eastern inner court and Jingshan are visible in the morning fog. 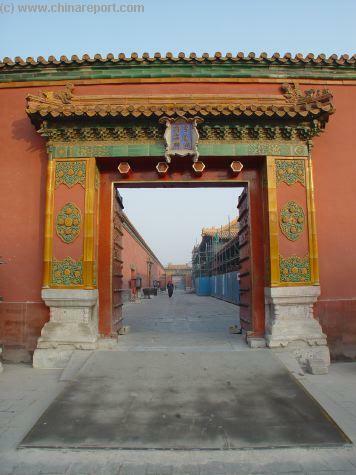 View of the western section at the Inner Court access Square with the Gate to the Western Long Corridor in central view. 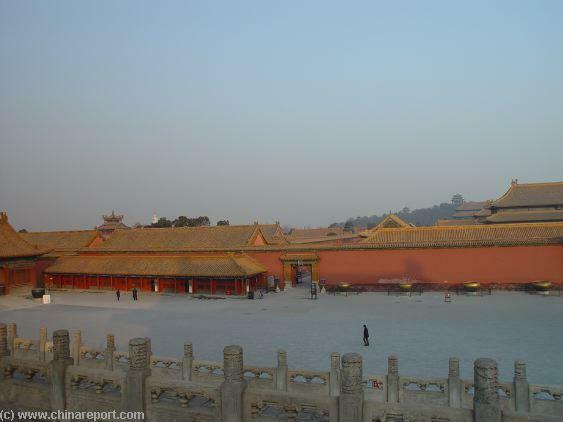 Jingshan and Beihai Parks' white dagoba are visible in the distance. 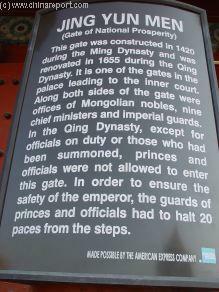 Gate of Heavenly Purity and it's rich Decorations. 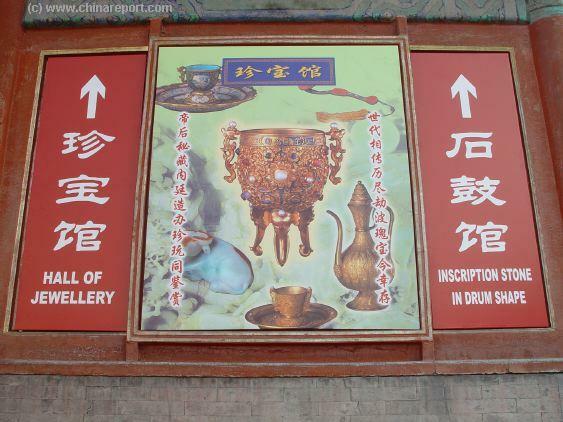 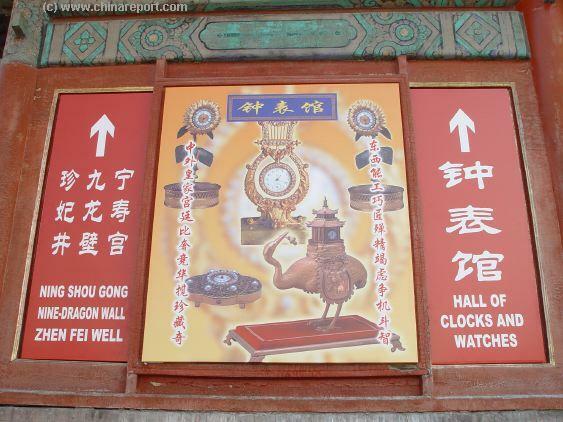 North to the Central Palace of Heavenly Purity and several Exhibitions. 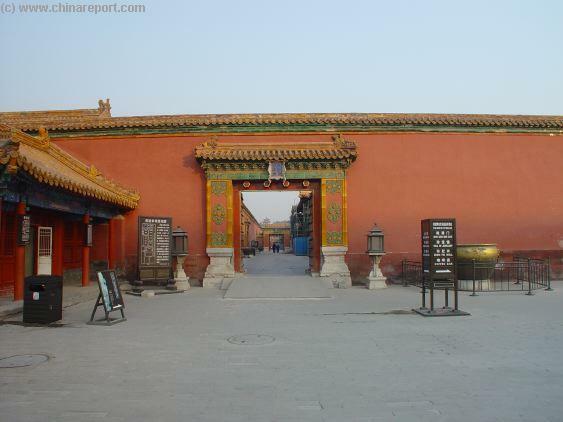 The South Gate of the Western Long Corridor leading to the Mental Cultivation Palace and other Eastern Palaces and Halls. 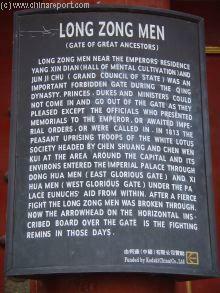 The Eastern Flank of the Gate of Heavenly Purity. 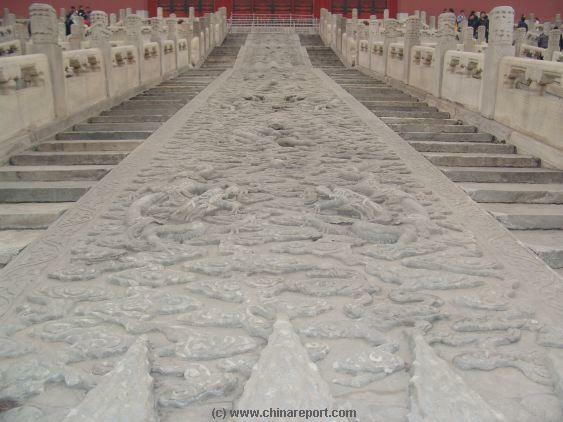 Carved with interlocking Lotusses around and curling waves at the bottom of the stone, the main depiction has no less than five dragons frolicking in the sky among clouds. 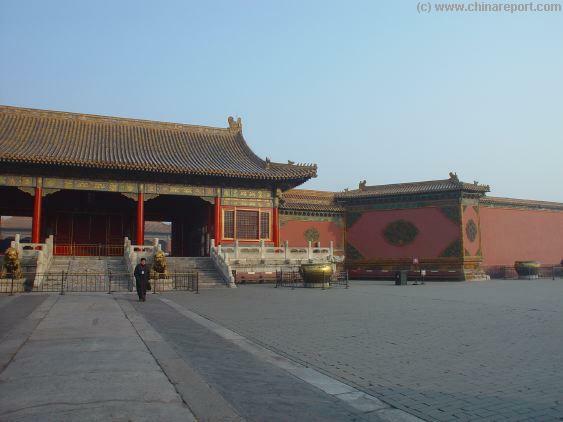 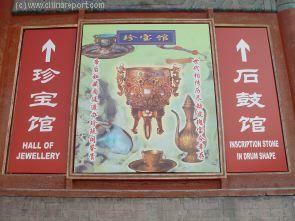 It is the largest art piece inside the Palace Museum. 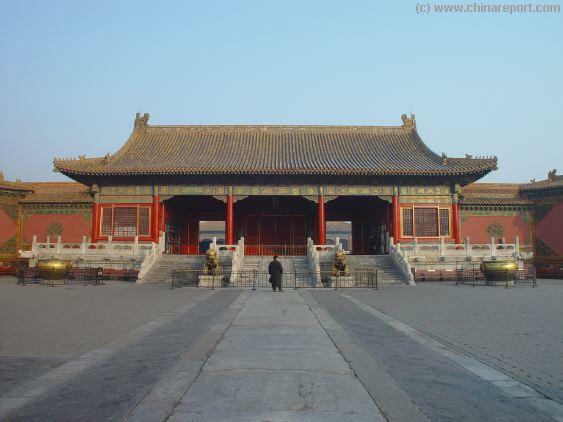 Music Bonus - "The Forbidden City", By Ennio Morricone.